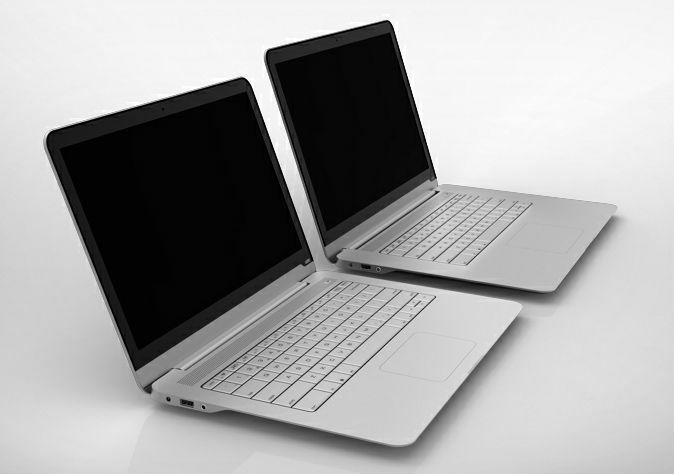 I’ll be the first to admit that I cringe a little inside when I see brand new laptops released in 2013 with 1366×768 displays. It seems like a real shame — many of these devices are beautiful machines but have a resolution that would have felt at home at least 5 years ago. For those looking for a crisp high resolution display there’s good news! The Ultrabook segment is home to at least 16 Ultrabooks with full HD 1920 x 1080p displays — in all shapes and sizes! 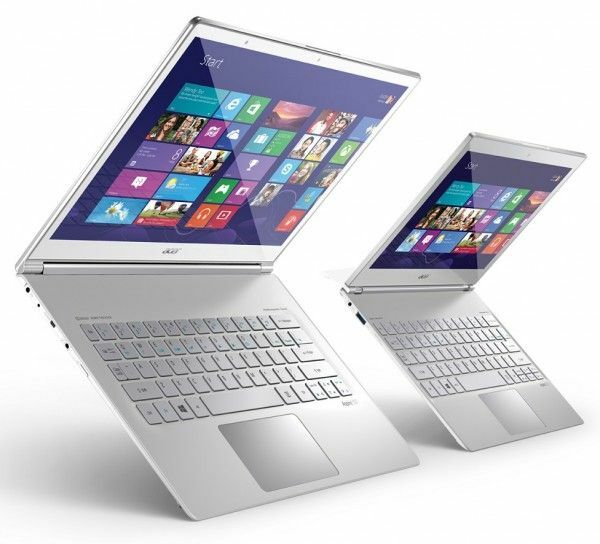 Good design, good keyboard, Displayport, Windows 8, Ivy Bridge and a 1080p IPS display. What more could you want? The original Dell XPS 13 has been upgraded with Ivy Bridge and that 1080p display but there’s no touchscreen and still no SD card. The battery capacity is still a rather weak 45Wh too. 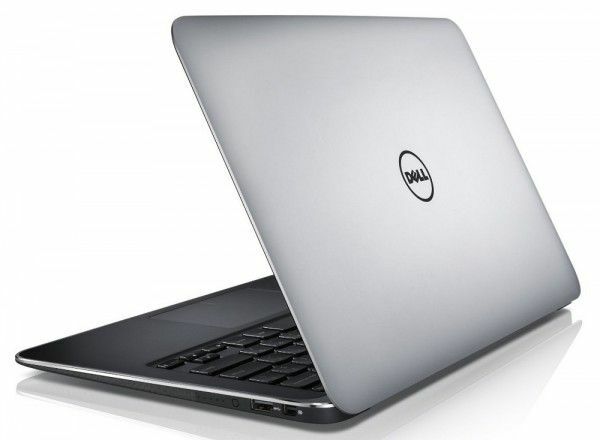 Anandtech have just reviewed the upgraded Dell XPS 12 with full HD display. The Dell XPS 12 has been sent for a quick review via the guys at Ultrabook-king.de and I’ve had a chance to do some testing already. The first thing I noticed was how solid it feels. 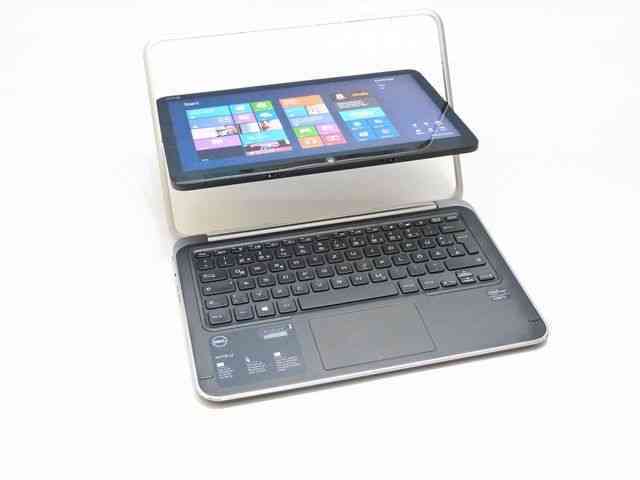 The hinge, frame, casing and keyboard seem top-notch although, probably as a result, it feels dense and a little heavy; Certainly too heavy to be a casual tablet. Here’s a first-report and your chance to ask questions. Back in May, I called out Acer for launching their Iconia Tab A500 and advertising that it could do 1080p output when it was actually unable to do so at the time of launch. Their self-imposed deadline for releasing an update to fix this has come and gone with no news from the company. The Iconia A500 launched back in May and has been rather well received. 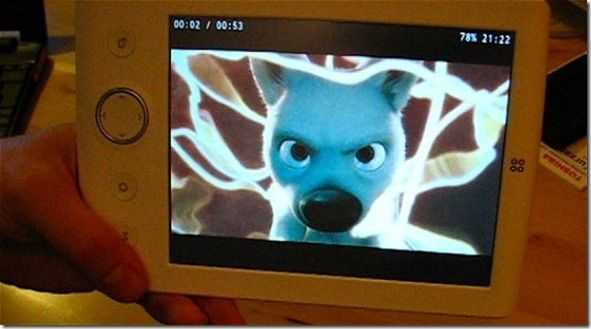 A number of users how now received the Honeycomb 3.1 update, and while it made some nice improvements, it didn’t enable the claimed 1080p output. Acer noted in some fine print that the device only supported 720p output through its mini-HDMI port at launch, despite claiming that it can do 1080p output in various marketing materials. The fine print went on to say that an update in June would enable the device to push 1080p video â€“ more than doubling the number of pixels of output â€“ through the mini-HDMI port. June came and went, and so did July. Now we’re into August, and even after the Honeycomb 3.1 update, we still can’t get the A500 to do true 1080p. That same fine print, claiming that an update will arrive in June, is still present on Acer’s site. We’re trying to get an official response from Acer, but I must say that I’m just about sick and tired of these unfulfilled update-promises. It’s about time Google get’s its update alliance rolling. Now I’m wondering whether or not Acer is going to try to pull the same stunt with the upcoming Acer Iconia Tab A100. Despite pushing the “1080p” line all up and down their press release, it looks like the Acer’s Iconia Tab A500 [tracking page] isn’t actually walking out the door with 1080p capabilities. According to a tiny footer I’ve discovered on the A500’s official product page, the unit can only currently push 720p video through its mini-HDMI port. However, an update slated for June will allow the A500 to output 1080p, more than 2x the current output resolution. It’s a good thing that the A500 is using the Nvidia Tegra 2 processor as it is indeed rated to handle 1080p output. Tegra 2 also supports decoding of a pretty impressive list of codecs, but in our testing so far, we’ve found that the A500’s built-in software can only play a very limited number of file-types. Here’s to hoping that this update promise doesn’t go the way of just about every other promised Android update from carriers or OEMs, you know… the way that they tend to come months later than expected. There’s no word yet as to whether or not the same update treatment will have to be given to the soon to be released Acer Iconia Tab A100/A101 [tracking page], or if it’ll actually ship with 1080p output capability. I admit was a little suspicious of the claims that the Galaxy Tab could play back ‘Full HD’ content but it’s now confirmed. I’ve managed to play back two 1080p H.264 format files. To be honest, 720p is the perfect fit for a device like this, especially as it has no digital video outputs (unconfirmed but ‘settings’ offers only PAL and NTSC as ‘TV-OUT’ options for the docking connector) but if you’re the sort of person that carries around films in 1080p format you’ll be pleased to hear this. There are caveats though. The first is that I’ve only managed to play back H.264 at 1080p levels. The second is that the Galaxy Tab doesn’t support multi-channel audio. I.e. it can’t mix down to two channels. Finally, I can’t seem to get an MPEG-2 file to play. Those with pure DVD copies (vobs) might want to take note and do some more research on that. In terms of video file format support I’ve had success with AVI and MKV containers and WMV, H.264, Xvid and Divx encoded video files. AAC and MP3 is supported (2-channel only.) In terms of bitrates, i’ve tested H/264 up to an average 13Mbps which is a very heavy load. The Tab handled it well with no visible dropped frames and no tearing. The screen quality is just amazing! Imagine this: When sitting on my sofa and holding the Tab about half arms-length from my eyes, it’s the equivalent of a 100cm diagonal screen where my TV is on the other side of the room! The player software is good and you can adjust screen brightness, (brightness, contrast and saturation is also available in system settings) to suit your preferences. There’s easy access to video size ratio changes, favourites and volume. Fast forwarding and skipping is very quick and there’s a great ‘Mosaic’ preview feature that allows you to preview various parts of a video using snapshots. The stereo speakers are really good although both are on the base of the device in portrait mode which means that when holding the device in landscape, the speakers are too easy to cover. The supplied headset quality is fine although not super high-quality. Portrait usage doesn’t seem to be supported but you can rotate the device through 180 degrees to put the headset port in a better position. 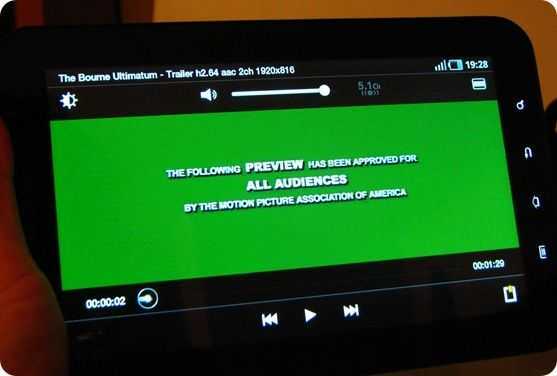 All in all the experience is excellent and rises way above most Android-based video experiences. The application used was Act 1 Video Player and clearly it’s using hardware acceleration. I’m impressed. You? 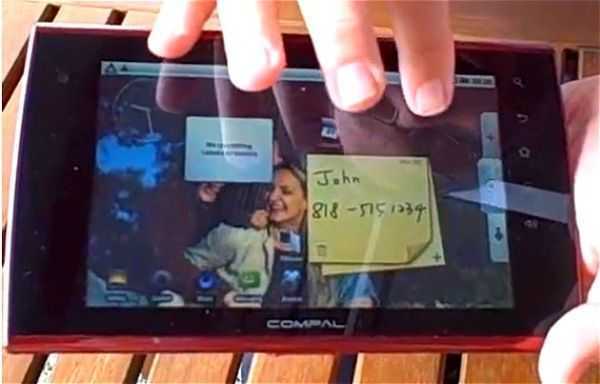 Bob Morris (ARM) Talks Consumer Tablets with Stacey and the Compal Prototype. Last time we caught up with Bob Morris, Director of Mobile Computing at ARM, we spoke at length about consumer tablets and smartbooks, the software stack and what would attract a customer. I also asked him how significant the ‘smart’ device category was. At that time he said it was ‘extremely important.’ I’m guessing that after just 3 months, the category has even more weight within ARM to the point where it’s on the critical path. I just can’t help thinking back to Origami when I see that tablet.